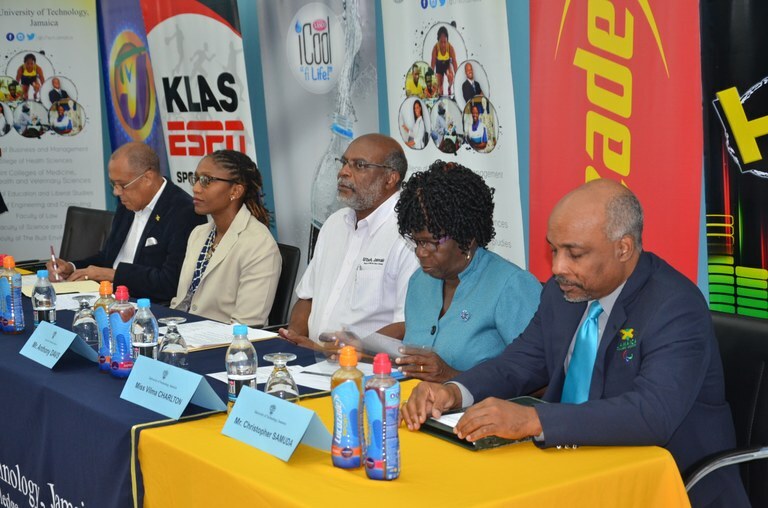 UTech, Jamaica Announces Plans for Track and Field Classic & Sport Sciences Conference — UTech, Ja. UTech, Ja. gears up for staging of premier sporting events: Plans were announced for the staging of the University of Technology, Jamaica’s (UTech, Ja.) 7th annual Caribbean Conference on Sport Sciences and 9th annual Track and Field Classic at a press conference launch held on Thursday, April 6, 2017 at the UTech, Jamaica Papine campus. Seated at the head table from left are, Mr. Aldrick McNab, OD, JP and Patron of the 2017 Classic, Dr. Kamilah Hylton, Dean, Faculty of Science and Sport, UTech, Ja., Mr. Anthony Davis, Director of Sport, UTech, Jamaica, Olympian Vilma Charlton and Mr. Christopher Samuda, President, Jamaica Paralympic Association. The University of Technology, Jamaica (UTech, Jamaica) on Thursday, April 6, 2017 announced plans for the staging of its two premier annual sporting events – the 7th annual Caribbean Conference on Sport Sciences to be held on Wednesday, April 12 at the University’s Papine campus and the 9th annual Track and Field Classic to be held at the National Stadium on Saturday, April 15 2017. Plans for both events were detailed at a press conference launch held at the University’s Papine campus. Dr. Kamilah Hylton, Dean, Faculty of Science and Sport in giving an overview of the highly anticipated one-day conference focusing on the theme ‘physical activity and health: moving from prescription to prevention,’ emphasized that “the science behind the immense success of our Olympians must be carefully studied and researched.” Dr. Hylton pointed out that “developing an elite athlete requires wide ranging attention to details such as biomechanics, nutrition and psychology.” These discrete areas and other aspects of research and developing global trends in sport science will be presented at the conference led by UTech, Jamaica’s Caribbean School of Sport Sciences. The conference is being held in partnership with the Ministry of Health and UNESCO. Among the distinguished cadre of local and international speakers will be plenary speakers, Catherine Carty, UNESCO Chair Manager at the Institute of Technology, Tralee, Ireland and Dr. Kingsley Chin, physician, inventor, entrepreneur, who has leveraged his degrees in engineering and medicine with his business experience to found several enterprises. In 2001, he founded MeduWeb.com, an Internet-based company focused on medical online distant learning using technology developed at MIT. The conference will also include live demonstrations by renowned United Kingdom based Tuina massage practitioner and Chinese medicine specialist, Errol Lynch. Tuina is an ancient healing art that employs the use of the hands to press on key points on the surface of the body to stimulate the body’s own natural healing process. Registration details on the conference are accessible at the University’s website: www.utechjamaica.edu.jm. Billed “Clash of Champions”, the 9th Track and Field Classic will run from 4:00 pm to 8:30 pm on Saturday, April 15. Director of Sport, UTech, Jamaica, Mr. Anthony Davis explained that the annual event is focused on the senior athletes within the collegiate system, along with top athletes outside the collegiate circuit including paraolympians. The event is also structured to provide a feeder system for top primary, prep and high school athletes to compete and to give athletes another chance to prepare for the Penn Relays. This year’s UTech, Jamaica Track and Field Classic, further provides preparatory race competition for athletes preparing for the world relays in the Bahamas scheduled for April 22 – 23, 2017. Mr. Davis reported that invitations have been extended to the ‘big four’ colleges – UWI, GC Foster, The Mico University College alongside the UTech, Jamaica Knights. Rising star athletes from EXED will also participate. Top athletes from Racers Track Club, Sprint Tech, Akan and Cameron Blazers clubs are also anticipated for action at the track and field meet. Championship action is also anticipated from finalists in the 4 x 100, 4 x 400 and the 4 x 800 at the recently concluded Boys and Girls Championships. Gates will open at 2:00 pm and tickets go on sale at the National stadium ticket office at 10:00 am on Saturday, April 15 at a cost of $1,000; students with ID - $700 and children under 12 admitted free. Only the Grandstand will be used. Olympian Vilma Charlton who brought greetings on behalf of Dr Warren Blake, President, Jamaica Athletics Administrative Association (JAAA) welcomed the sport sciences conference for its focus on the application of science to coaching. Encouraging collegiate athletes to participate, she noted that the JAAAs has recommended that “ all intercollegiate athletes who hope to be selected for the World University Games this Summer in Taipei, Taiwan should compete in the UTech, Ja Classic” as part of their performance for selection. Mr. Christopher Samuda, President, Jamaica Paralympic Association in his greeting said that for the Association “the meet provides an opportunity for personal and institutional growth and is an experience along the journey from which lifelong lessons will be learnt and applied.” He added that the UTech, Jamaica Track and Field Classic is a qualifying meet for para athletes to make their mark in qualifying for the global stage at the London World Para Athletics Championships scheduled for July 14-23, 2017. Representatives from the sponsoring companies for the Track and Field Classic in their remarks, all endorsed that the Meet and indicated that their respective organizations are happy to be on board for an event that supports national development in sports. Sponsors are Nike, Lucozade Sport, ICool, TVJ Sports Network, KLAS ESPN, Hitz FM, RJR, Jamaica Observer, Guardian Group and On the Run Events Management.